The second anniversary of the 22 May 2017 Manchester Arena terror attack, which took 22 lives, will be marked with a civic memorial service at St Ann’s church at 2pm on Wednesday 22 May 2019. Although it is recognised that many more will want to attend, it has been agreed with the families that the service will be a personal and private event for the families who lost loved ones, those injured and representatives of those who were first to respond. While it was right that the first anniversary last year was marked with a series of high profile events, in consultation with families it has been agreed that this year’s anniversary will be more intimate. Like last year, at 10.31pm on 22 May – the exact anniversary – bells will ring out from buildings across the city centre including Manchester Town Hall, Manchester Cathedral and St Ann’s Church. 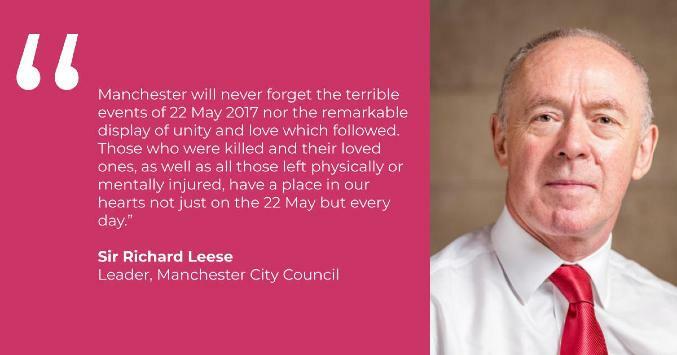 Sir Richard Leese, Leader of Manchester City Council, said: “Manchester will never forget the terrible events of 22 May 2017 nor the remarkable display of unity and love which followed. “Those who were killed and their loved ones, as well as all those left physically or mentally injured, have a place in our hearts not just on the 22 May but every day. “The anniversary has a particular resonance but especially for the families who lost loved ones. As always, their views are paramount in our considerations. “Everyone's experience of the terrible events of 22 May 2017 was different and we recognise and respect that others may wish to mark it in their own ways. In consultation with families, a site has now been earmarked for the 22 May memorial – on land between Hunt’s Bank and Deansgate, close to the Arena and Cathedral and near the River Irwell. Further outline details will be announced before the anniversary once a creative brief outlining the principles behind the memorial has been finalised. Professor Malcolm Press, chair of the Manchester Memorial Advisory Group, said: “We have listened carefully to a range of views, most importantly those of the bereaved families, about our whole approach to a memorial. Manchester Cathedral will be open through the day on 22 May and all are welcome to spend some time in quiet reflection and prayer. There will be opportunities to light a candle and spend time remembering those who died, those still suffering physically and mentally and everyone affected by the attack.